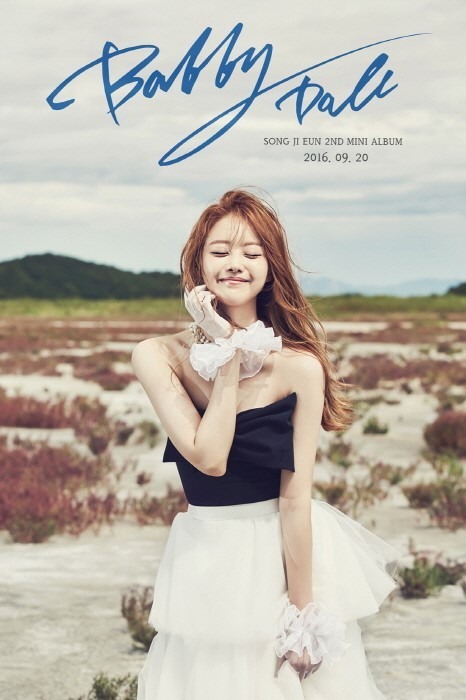 K-pop group Secret’s member Song Ji-eun is making a return as a solo artist for the first time in two years. The 26-year-old singer released a teaser image for her second mini album “Bobby Doll” on Secret’s official social media channels Tuesday. The album’s lead song -- also titled “Bobby Doll” -- is a dance track with an acoustic-based tune, according to the artist’s management agency TS Entertainment. The upcoming six-track mini album features lyrics and production by in-house composer Park Soo-suk, global music production company Iconic Sounds’ Kim Tae-sung and American producer Cha Cha Malone, among others. After debuting as a member of the K-pop quartet Secret in 2009, Song officially launched her solo career with the hit single “Going Crazy” in 2011. She released her first mini album “25” in 2014. “Bobby Doll” is scheduled to be launched on local music platforms on Sept. 20.